Sports and science fiction, much like jocks and nerds, don’t always get along. However, one sports news site is bringing football into the future with a series that’s weird, complex, and pretty spectacular. 17776, from SB Nation creative director Jon Bois, is an ongoing scifi series using text and YouTube videos to examine what football will look like in the future. 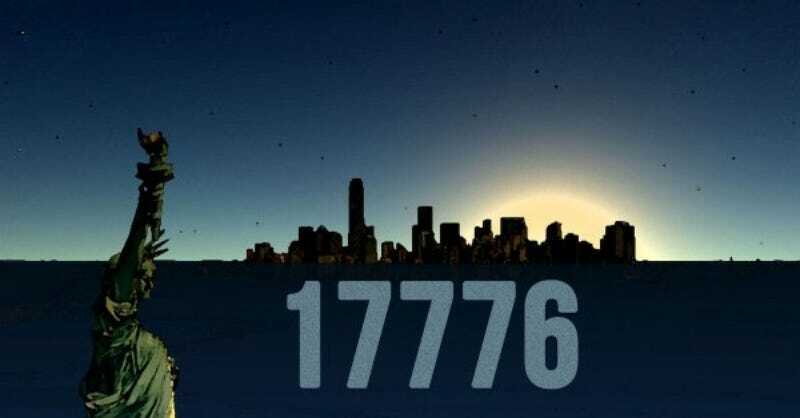 It may sound like that one scene from Starship Troopers, where it’s basically football with weirder outfits, but 17776 is actually more akin to Homestuck (a web comic). It’s a deep thought experiment into what we consider humanly possible. I’m going to discuss a few basic plot points below, but if you want to go in blind here’s the link. The series stars a newly sentient space probe, Nine— based on the Pioneer 9, a real probe that NASA abandoned in the 1980s. Nine has woken up after over 15,000 years of dormancy to learn that humankind has achieved immortality. No one is born, no one dies, and no one ages. In order to pass the time, people play years long games of football that spread from America’s coast to coast. Of course, it’s unclear how much of this is actually true. Nine is getting their information from two other sentient spacecrafts, Ten and Juice, who play the respective angel and devil on Nine’s shoulders. Plus, the teaser video for the series launch shows New York City entirely underwater. The whole thing could take place post-humanity, with the spacecrafts unable to cope with or grasp the concept or life after their creators. The story is being revealed, chapter by chapter, through July 15. And even though it’s only halfway done, it’s already got some major fans. There’s already a Juice cosplay! That’s some serious deep-cut dedication right there. Which real-life sport is the best choice for scifi/fantasy fans?